The principle of present work is to build up a plant-based method to reduce toxicity in our body which is caused due to high level of some essential trace metals. This current effort is concerning to investigate complex of β- Sitosterol with Co, at different mole ratio and their antimicrobial activities. Complexes of β-sitosterol (βs-Co) were formed with Co, at mole ratio of (1:1) (1:2) and (1:3). By pH metric titrations complex formation has been determined. After the formation of complexes metals are unable to absorb in our body and are excreted out in the form of complex from our body. In vegetable most common plant phytosterol; β-sitosterol is present through intake of vegetable toxic metal can be eliminate out from body. Antimicrobial results indicate that all the complexes of βs-Co have potential to kill various types of fungi and bacteria therefore these complexes can be used as the therapeutic agent for the treatment of bacterial and fungal infection. These complexes might be an excellent therapeutic runner for sake of different treatment but when completely explore from all parameter. In our body metals are an integral part of many functional as well as structural components in pathological and physiological processes critical role of metals have always been of great interest for researcher. Metals are used to restore the normal healthy physiology of body; either by chelating out excess or toxic metals ,direct administration of essential metals or for tagging biomolecule for diagnostic and using them as carrier for targeted drug delivery. Exposure to heavy metals from various sources and essential metal overload are responsible for metal toxicity. Metal interfere with the function of several organ systems such as kidney, liver, lungs haematopoietic system, central nervous system [Swaran 2010]. Ions and molecule bind with metal ion by chelation, chelating agent are inorganic as well as organic compound by binding metal ions they form complex ring-like structure known as chelate [Andersen O, 1999]. This complex structure is easily excreted from body by removing them from intracellular or extracellular spaces. Organic compound β-sitosterol is present in many vegetables as well as in many fruits. Many scientific researches proved that for maintaining health, from protection against many serious health disorders and diseases β-sitosterol is safe and nontoxic plant nutrient. Patients on diets devoid of plant sterols quickly became free of β-sitosterol [Oja 2009] generally which implies that nutrients should be taken daily for excellent health and better functioning of immune system [Matsuoka et al. 2008]. β-sitosterol posse’s antidiabetic, antihyperglycemic, and antibacterial, anti inflammatory, antipyretic acridity also antimicrobial, anti cancers. It is also beneficial for uterus and used to improve blood parameter [Normen et al. 2001]. For physiological activities in mammal also in humans 23 elements are identified. From these elements eleven trace elements such as Cr, Mn, Fe, Co, Ni, Zn, Cu, V, Se, Mo and Sn are essential element. [Murray et al. 2009]. When the concentration of these essential metals exceeds which is necessary for their biological function they become toxic. For example large doses of cobalt (Co) may stimulate thyroid and bone marrow fraction [Fraga 2005]. Metal toxicity is more severe than organic toxicity because organic compounds may decompose but metals retain their identity in body. Most commonly used technique to treat heavy metal toxicity is chelation therapy. It involves administration of chelating agents to eliminate heavy metals from body [Marsha 1996]. In present paper we explore complexation of β-sitosterol with Co, at different mole ratio. pH metric titration is used to study the formation of complex [T Mahmood et al]. Antifungal as well as antibacterial activities of these complexes are also investigated. Reagent and glassware: Analytical grade reagent were used, purchase from Bio Basic Inc and Merck. All glassware used was of standard quality. Glassware are properly cleaned and rinsed with distilled water and dried before used. For potentiometric study salt of cobalt nitrate is used. Electrical balance: For weighing, Denver Instrument, TP- 214 was used. pH meter: For pH metric titration, Jenway, model 3510 was used. Stirrer: for stirring, hot plate stirrer (lab Tech) with bead was used. pH metric titration: pH metric titration was done at 25±50C. Before titration of sample solution Sodium hydroxide solution was standardized using standard oxalic acid every time. Conical flask cover with rubber stopper is sued for all pH metric titration. This rubber stopper has four holes, one for purging inert gas (Nitrogen), and another for removal of oxygen, third for glass electrode and fourth for burette for addition of standard base. By passing Nitrogen gas for 30 minutes inert atmosphere is obtained in solution. pH metric titration of ligand (β-sitosterol): For this purpose, in a conical flask containing magnetic bead, 10mL of chloroform and 40 mL of β-sitosterol solution (10-2) were taken. For half an hour purified nitrogen gas was purged in this solution. After that β-sitosterol solution was titrated against 0.1 M standard NaOH solution. Sodium hydroxide solution was prepared in methanol. Sodium hydroxide solution was standardized using 0.05M oxalic acid solution prior to the pH metric titration of β-sitosterol. Magnetic stirrer is used for continuous stirring during titration. With the help of burette standard NaOH was added in sufficiently small increments of 0.1 ml and after each increment pH of reaction mixture was recorded till pH was not affected by further addition of standard NaOH. pH values were plotted against the added volume of standard NaOH. pH metric titration of Co (II) with β-sitosterol: In order to obtain metal-ligand complex pH metric titration of Co with β-sitosterol were performed. β-sitosterol solution (10-2M) solution is prepared in methanol: chloroform (1:1) and metal solution (10-2M) is prepared in methanol. By taking 10mL of β-sitosterol solution and 10mL of metal solution 1:1 metal ligand solutions is obtained then add 30mL solvent in this solution. The mixture obtained was subjected to titration by using (0.1M) NaOH solution as a standard and under the same condition as used for earlier mention titration. Change in color at different pH confirmed the formation of complex. The above procedure is also repeated for mole ratio i.e. (1:2) and (1:3). The above procedure is also performed for the formation of Nickel Sterol complex but no change in colour takes place at any mole ratio. Preparation of media for antimicrobial activity: Muller Hinton agar and Muller Hinton broth  was used as the media for culturing bacterial strains and Sabourd dextrose agar (SDA) [Smyth et al.] was used as the media for fungal strains. Screening of antibacterial activity: Antibacterial activity of βs-Co (1:1, 1:2, and 1:3) against the test organisms were determined by using agar-well method. The Autoclaved Muller Hinton broth was used to refresh the bacterial culture, later well were punched into Muller Hinton Agar and 10 micro liters of culture were poured into the wells [Perez and Bazerque 2009].For screening of antibacterial activity 10mg/mL of sample is used .All plates were incubated at 28±2oC for 24-48 h and after the incubation diameter of zone of inhibition was noted by vernier caliper. Gentamicin antibiotic was used as a standard. Screening of antifungal activity: Antifungal activity of βs-Co (1:1, 1:2, and 1:3) was determined by using the agar-well method. Autoclaved distilled water was used for the preparation of fungal spore suspension and transfer aseptically into each SDA plates [Wuthi-udomlert and Vallisuta 2011]. For screening of antifungal activity 10mg/mL of sample is used. All plates were incubated at 28±2oC for 24-48h and after the incubation diameter of zone of inhibition was measured by vernier caliper. Gresiofulvin antifungal agent was used as a standard. Determination of Minimum inhibitory concentration (MIC): Minimum inhibitory Concentration (MIC) was determined by Micro broth dilution method using 96-well microlitre plate. Two fold serial dilutions of extracts was made in 100 µl broth and subsequently 10 µl of two hour refreshed culture matched with 0.5 Mac Farland index was added to each well. One well served as antifungal agent control while other served as culture control. Microtitre plate was incubated for 24 hours at 37 ºc. The MIC was read as the well showing no visible growth. Initially β- sitosterol titration was performed as a reference. 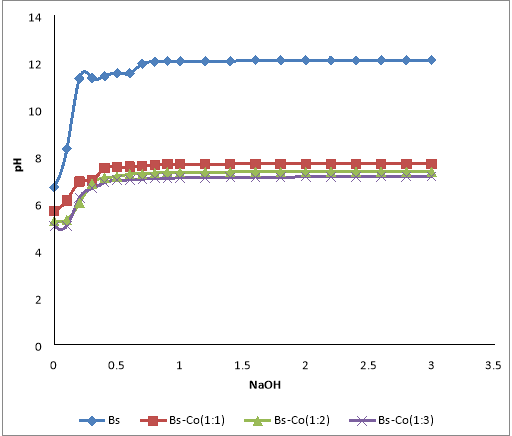 In a plot of pH against added volume of NaOH only one curve was observed near pH 12.2. Remarkable changes in titration curves of β- sitosterol and its complexes were observed (Fig.1), which indicates complexation between metals and β- sitosterol. Complexation of β-sitosterol with cobalt was confirmed by a change in color from Pink to Peach in case of βs-Co (1:1) at pH 7.68, βs-Co (1:2) at pH 7.35, and βs-Co (1:3) at pH 7.14. Complex of βs-Co (1:1) (1:2) (1:3) are formed at relatively high pH has moderate stability. From the present learning it is exposed that β- sitosterol is helpful for removing toxicity of essential element by forming metal sterol complex and this essential toxic metal are excreted out from the body. [Marsha 1996]. The antimicrobial activities of complexes of βs-Co show that they are also helpful in minimizing bacterial as well as fungal infection. The results of antibacterial and antifungal activity are presented in Tables. Table 3 – Screening of antifungal activity of βs-Co (1:1), βs-Co (1:2) and βs-Co (1:3) against pathogenic fungi. Conclusion: In present research work complexation of beta sitosterol with Co, at different mole ratio along with their antimicrobial activities has been studied. Complexation of β- sitosterol with Co i.e. βs-Co showed that complex formation takes place at neutral pH and have moderate stability. From centuries chelation therapy has been used to treat metal toxicity (Marsha, 1996).Their target organ are Kidney, central nervous system and cardiovascular system (Howland, 2011). In present paper β-sitosterol form complexes with Co successively, hence can be used as chelating agent in chelation therapy. From result it is revealed that in case of essential metal toxicity βs-Co could be helpful in removing metal toxicity from the body. It could perform this by forming complexes with cobalt which exceed the toxic level. This metal after formation of complex will be unable to absorb in the body and then excreted from the body in the form of complex. It is concluded that these complexes are not only reduce cobalt toxicity also the antimicrobial activity of βs-Co exposed that these complexes are effective against many bacterial and fungal infection. Fraga, Cesar G. (2005). Relevance, essentiality and toxicity of trace elements in human health. Molecular Aspects of Medicine 26: 235–244. Howland, M.A. (2011). Deferoxamine. In: Nelson, L.S., Lewin, N.A., Howland, M.A., Hoffman, R.S., Goldfrank, L.R. And Flomenbaum, N.E. Goldfrank toxicology Emergencies. New York: Mc Graw-Hill.604-608. Jones MM. (1994). Design of new chelating agents for removal of intracellular toxic metals. In: Kauffman GB, editor. Coordination Chemistry: A Century of Progress. The American Chemical Society; pp. 427–438. Marsha, D.F. (1996). Heavy metals. In Emergency Medicine- A compressive review, 4th edition, edited by J. E. Tintinall, E. Ruiz, and R.L. Krome, 833-841. Matsuoka, K., T. Nakazawa, A. Nakamura, C. Honda, K. Endo, and M.Tsukada. (2008). Study of Thermodynamic Parameters for Solubilization of Plant Sterol and Stanol in Bile Salt Micelles. Chem. Phys. Lipids 154: 87-93. Murray, R. K., D. A. Bender, K. M. Botham, P. J. Kennelly, V. W. Rodwell, P. A. Weil, and P. A. Mayes. (2009). Chapter 44. Micronutrients: Vitamins & Minerals”. Harper’s Illustrated Biochemistry. 28th Ed. New York: McGraw-Hill. Normen, A.L., H. A. Brants, L. E. Voorrips, H.A. Andersson, P.A. van den Brandt, and R.A. Goldbohm. (2001).Plant sterol intakes and colorectal cancer risk in the Netherlands Cohort Study on Diet and Cancer. Am J Clin Nutr. 74: 141-148. Oja, Vahur, et al. (2009). Sublimation Thermodynamic Parameters for Cholesterol, Ergosterol, β-Sitosterol, and Stigmasterol. Journal of Chemical & Engineering 54(3): 730-734. Perez C, Paul M and Bazerque P (1990).An antibiotic assay by the agar well diffusion method. Acta Biol Med Exp. 15: 113-5. Swaran J .S Flora and Vidhu Pachauri (2010). Chelation in metal intoxication. Int J Environ Res Public Health. ;7(7): 2745–2788. "β- Sitosterol with Co Analysis." UKEssays.com. 11 2018. All Answers Ltd. 04 2019 <https://www.ukessays.com/essays/biology/complex-sitosterol-co-analysis-1384.php?vref=1>. "β- Sitosterol with Co Analysis." All Answers Ltd. ukessays.com, November 2018. Web. 26 April 2019. <https://www.ukessays.com/essays/biology/complex-sitosterol-co-analysis-1384.php?vref=1>. UKEssays. November 2018. β- Sitosterol with Co Analysis. [online]. Available from: https://www.ukessays.com/essays/biology/complex-sitosterol-co-analysis-1384.php?vref=1 [Accessed 26 April 2019]. UKEssays. β- Sitosterol with Co Analysis [Internet]. November 2018. [Accessed 26 April 2019]; Available from: https://www.ukessays.com/essays/biology/complex-sitosterol-co-analysis-1384.php?vref=1.